Edwin A. Jackson & Bro. started out at 315 E. 28th St. around 1880, moved to 77 Beekman St. approximately 1883, and then to 50 Beekman St., where they were located from 1888 to 1941. They also did business under the name Jackson Ventilating Grate Co. The company name changed to Edwin Jackson Inc. in 1931, and they were in business in New York City under this name until 1996. They were primarily manufacturers of mantels and fire place fixtures. This ad for Edwin A. Jackson & Bro. dates from 1886 when they were located at 77 Beekman St. This ad for Edwin A. Jackson & Bro. dates from 1889 when they were located at 50 Beekman St. This ad for Edwin A. Jackson & Bro. dates from 1891 and appeared in The North American Review, Dec. 1891. This ad for Edwin A. Jackson & Bro. dates from 1899 and appeared in American Homes, Aug. 1899. This ad for Edwin A. Jackson & Bro. dates from 1900 and appeared in The Literary Digest, June 1900. All of these ads promote the Jackson Ventilating Grate. An early (1880) description of the Jackson grate appeared in the publication Carpentry and Building, Sept. 1880, a google book. A more detailed description of Jackson's ventilating grate is found in The Open Fire-Place in All Ages, by John Pickering Putnam, (1882), also a google book. The two brothers were Edwin A. Jackson (ca.1835-1896) and William Morris Jackson (1837-1919). The 1850 U. S. Census recorded Edwin A. Jackson, age 15, and William M. Jackson, age 13, living in the family of James M. Jackson, age 53, a farmer, in Richland, Bucks County, Pennsylvania. In the 1870 census Edwin Jackson was 35 years old and lived at 40 W. 39th St., New York City. He lived with his wife, Jenny, aka Jane Foulke Levick (born 10 March 1842). They were married 9 June 1870. Edwin Jackson's occupation was "Grate & Fender." At this time he was employed at Wm. H. Jackson & Co., a grates and fenders manufacturer whose history can be found at the Wm. H. Jackson page. The earliest mention I have found to the Jackson Ventilating Grate was in the publication Carpentry and Building, Sept. 1880, in an article entitled "The Warming and Ventilation of Dwellings." The same year Edwin A. Jackson's "Patent Heat-Saving and Ventilating Grate, Factory and Office," was located at 315 East 28th St., N. Y., in The Architect, Builder and Woodworker, Dec. 1880. William M. Jackson, "Grate Manufacturer," appears in the 1880 U. S. Census living at 335 W. 18th St., Manhattan. He was 43 years old, born Pennsylvania, and lived with his wife, Anna M. Jackson, and three small children. (One of the children was William W. Jackson, age 8, who later became president of Edwin Jackson Inc.) William M. Jackson also appears in the U. S. Census reports of 1900 and 1910. In 1900 he was 63 years old, born April, 1847, but the 1847 must be an error for 1837. In 1910 he was 73, still a manufacturer, and lived at 540 W. 122nd St., Manhattan. His death notice, New York Times, 9 July 1919, read, "Jackson - On Tuesday, July 8, 1919, William M. Jackson, husband of Anna M. Jackson. Funeral services at Friends' Meeting House, 221 East 15th St., New York, Thursday, July 10, at 4 P. M. Kindly omit flowers." William Walter Jackson (ca.1872-1953) was the son of William M. Jackson, and president of Edwin Jackson Inc. from 1919 to 1940. His obituary in the New York Times, 30 Jan. 1953, read in part, "William Walter Jackson, former president of Edwin Jackson, Inc., 159 East Fifty-fourth Street, manufacturers and importers of fireplaces, died on Wednesday at his home, 195 Hicks Street, Brooklyn, after a long illness. His age was 80. Mr. Jackson, who was born in Richmond, Ind., attended Columbia College with the class of '92. He was associated with the Jackson firm, which was founded by his uncle, the late Edwin Jackson, from 1895 until his retirement in 1942 and president of the firm for the last twenty-five years of that time." Edwin A. Jackson secured a number of patents in the 1870s and 1880s, including "Improvement in Fire-Place Fronts" (no. 144,459 dated 11 Nov. 1873) filed 4 Aug. 1873, "Improvement in Faucets for Oil-Cans" (no. 156,290 dated 27 Oct. 1874) filed 1 Aug. 1874, "Improvement in Gas or Oil Stoves" (no. 204,490 dated 4 June 1878) filed 4 May 1878, "Improvement in Open Fire-Places" (no. 220,843 dated 21 Oct. 1879) filed 15 Sep. 1879, "Design for a Fire-Place Front" (no. D16136) issued 23 June 1885, and "Ventilating-Grate" [The Jackson Ventilating Grate] (no. 353,066 dated 23 Nov. 1886) filed 3 April 1886. The Jacksons were members of the Society of Friends (Quakers). William M. Jackson is mentioned in the New York Times, 27 May 1880, as clerk of a New York meeting. He and his wife, Annie, are mentioned as prominent members of the Hicksite "sect" in another Times article, 9 August 1894. As described in the "Inventory of the Branson-Jackson Family Papers, 1794-1962," at Swarthmore College, "William M. Jackson (1937-1919) was the son of James M. and Mary Ann (King) Jackson of Philadelphia and later of Richland, Pennsylvania. He served on the Board of Managers of Swarthmore College from 1887 until his death in 1906 [sic] and on the Board of Schofield Normal and Industrial School from 1887 or 1888 until after 1892. He was also a member of the Board of Trustees of Friends Seminary in New York." His wife, Anna Margaret (Davis) Jackson (1848-1920), at the same source is described as a Quaker activist, "very involved in reform activities in New York City. She served as Chairman of the Women's Prison Reform Committee, and was also involved in the Women's Municipal League and the Political Study Club." Another Edwin A. Jackson & Bro. 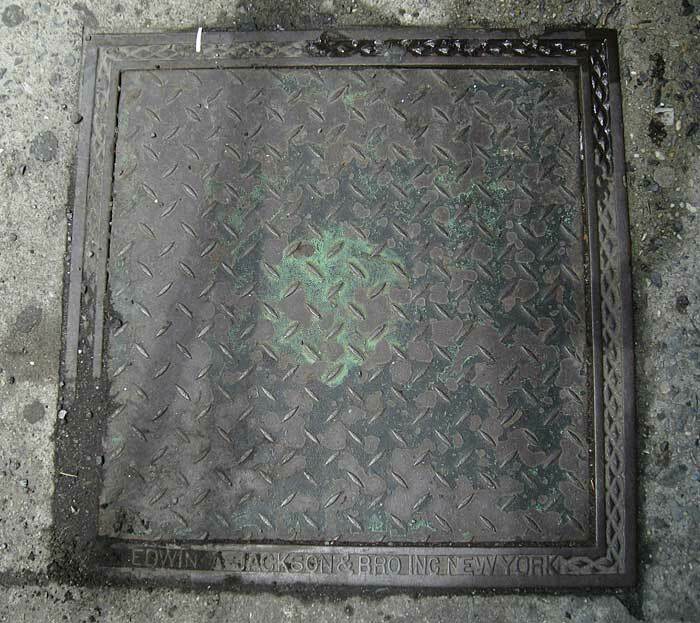 coal chute cover is found at the 51st St. side of 30 Beekman Place, Manhattan.